One Venue / Over 7 crews / An electronic Sensory experience. 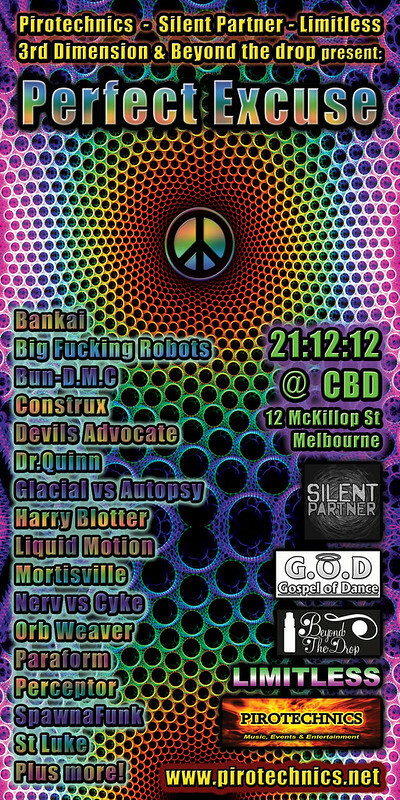 Come join the tribes and celebrate the End of the World, the Festive Collective, the Christmas Connection! A celebration of what ever you choose! Be it the Apocalypse & end of the world. Be it Christmas or Festivus. Be it the end of the Mayan Calendar. Be it your Cat or Dogs Birthday. And we have the PERFECT EXCUSE! Come and reconnect with old friends, make a new connection with a friend you’ve never met or connect with the dance floor. December 21st 2012 is a time to make a deeper connection and re align yourself. With over 5 crews connecting together to create a magical experience, this is the perfect excuse to forget about everything else for a night and come enjoy life! “Mushroom Cup” – A Psychedalic Journey playing Prog thru to Full On PSY! CBD Nightclub – 12 McKillop St City.